Not too many bands get a second chance at life, a ressurection of from the tombs of forgotten heavy metal bands. But minor Eighties heavy metal sensation Ruthless did. They had a short eight year run in the Eighties with an EP and one full-length album before disbanding. Then some dude, at least one with a good memory, at the Keep It True festival in Germany, remembered the band and invited them to perform in 2009. (The entire performance may be seen below.) It appears the band thought this merely a nostalgic one-off shot, but then members Sammy DeJohn (vocals) and Kenny McGee (guitars/vocals) started tossing around some ideas. Born from those ideas and recording sessions is They Rise, Ruthless' third album, the first in nearly thirty years. Tapped by Pure Steel Records for promotion, you get nine new songs and all five songs from the Metal Without Mercy EP from 1984. Essentially, what you have is classic American heavy/power metal, with more than a little influence from the New Wave of British Heavy Metal. 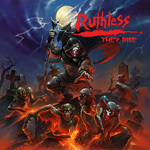 Ruthless works from a proper balance of steadiness and speed for their power metal, beginning with a rugged and rumbling rhythm section. Clean melodic riffs are layered upon this, and then salted with an abundance of twin guitar leads. At the front, vocalist Sammy DeJohn has a pure classic heavy metal voice, maybe with a touch of Dickinson, but mostly steady and melodic. The musical elements work like so many tasty ingredients for a heavy metal stew. You have some swifter material with Defender, The Fever (from the EP), and Frustration, which also has a bit of a punk vibe going on. Yet, generally, Ruthless will mix things up: speed and moderation within a single arrangement as with Hang Man or Out of the Ashes. Another song like Laceration will have some light moments, at the start and later just after the midpoint, mostly breakdowns that feature sweet guitar work. Alternatively, within the title cut you have a more thumping pace that nears doom metal. But the standout cut here is Time Waits, a true metal anthem. It has a fine groove from the bass line, more tasty riffs and sweet leads, with DeJohn's melodic vocals floating over all. Nice stuff. As for the EP material, you'll find first the obvious roots of the band, but also some surprisingly solid musicianship and production. Curiously, DeJohn's vocal style teeters between metal screamo and a punk sneer. I think he sounds better today. Essentially, between the new and old tunes, you get an audio image of Ruthless' heavy/power metal, both past and present, and they dovetail exceptionally well. Here's hoping, their second life will be as long as the first. Recommended. With They Rise, between the new and old tunes, you get an audio image of Ruthless' heavy/power metal both past and present, and they dovetail exceptionally well. Here's hoping, their second life will be as long as the first. Recommended.